Tesla Inc (TSLA - Get Report) has come under a lot of heat lately, with shares falling almost 20% over the past five trading sessions through Monday. On Monday, it was down more than 4.5% and nearing its 52-week lows, although so far on Tuesday it's getting a nice bounce back to $260. A blown settlement between the SEC and CEO Elon Musk led to a one-day 14% bludgeoning of the stock in late-September. That's all it took, as a day later shares were 17% higher after the parties agreed to a similar settlement. Since then though, it's been a rough ride for the bulls. It's forcing some investors to look elsewhere for their do-good, all-electric car investments. While companies like General Motors (GM - Get Report) , Daimler (DDAIF , Toyota (TM - Get Report) and others have electric car offerings, none of them are quite like Tesla. Debating a Buy in Nio? Chinese electric vehicle maker Nio went public last month and has been on a whirlwind of a ride since. Volatility must come with the all-electric territory. The company priced its stock at the low end of the range, between $6.25 and $8.25, as SoftBank (SFTBY decided to skip an investment in the company's IPO. That's notable, as TheStreet has previously pointed out that SoftBank is becoming a leader in the future of auto thanks to its many investments in the industry. On its first day of trading, Nio dropped to as low as $5.35, weakening confidence even more. But that didn't last long. Shares hit $12.50 in its second session, almost doubling from the close on its first day of trading. Those gains extended to $13.85, the current 52-week high, the following day before embarking on a multi-week pullback. Now trading at $6, investors contemplate a limited risk/reward play in the name. With its 52-week lows about 70 cents away, maybe it's not the worst buy in the world, particularly as Tesla stock continues its drumming. Then again, why buy Nio at a time where Tesla -- which produces and ships vastly more vehicles and is considered electric-vehicle leader -- can't even catch a bid? 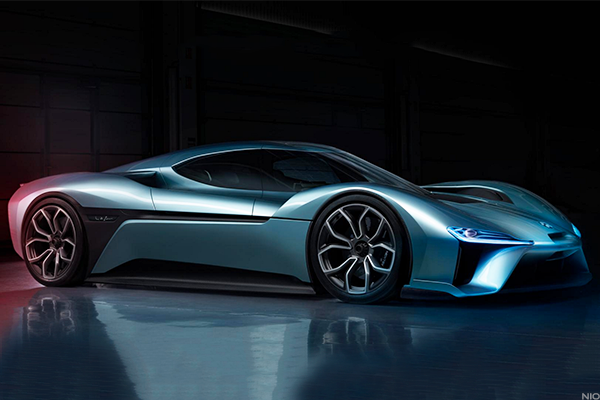 Nio just began shipping its first vehicle in China earlier this summer. Through August, it has shipped less than 2,000 vehicles, less than Tesla manufacturers in a week at current rates. In any regard, what's the upside? Nio sports a market cap of roughly $5 billion, a rather lofty mark considering that a company like General Motors trades with a market cap of "just" $48 billion. That's not stopping some analysts though, as the quiet period has ended and many are out with their ratings. Morgan Stanley hit Nio with an overweight rating and $8.50 price target, while Deutsche Bank analysts assigned a buy rating and $9.50 price target, implying almost 60% upside. Goldman Sachs and Citigroup analysts both assigned a neutral rating, using price targets of $6.56 and $7.20, respectively. Even Goldman's price target -- the lowest of the group -- implies almost 10% upside from current levels. On Tuesday, JPMorgan analysts assigned a neutral rating too, to go along with its $7.50 price target. Based on current prices, that implies more than 20% upside to current levels. Shares are currently changing hands near $6.17 in early Tuesday trading, likely getting a boost from the analysts' reports, which tilt slightly bullish. The valuation can be tough to swallow, even with Nio stock down at $6. For that matter, Tesla's valuation is tough too. For those that want to play the future of auto but don't want to pay a huge valuation, consider Alphabet (GOOGL - Get Report) (GOOG - Get Report) for Waymo, General Motors for Cruise (now valued at more than $14 billion!) and Nvidia (NVDA - Get Report) for its industry-leading hardware.